Last week, Mara Gorman and I went to Haiti to visit a couple of communities where water wells were (and still are being) constructed. These are wells funded by the Passports with Purpose fundraiser late last year. 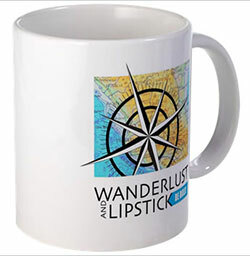 In total, we raised just over $116,000 which will ultimately fund six wells (whoo hoo!). It was a whirlwind trip (we were there for 2.5 days) but we packed a lot activity into that brief time. There’s so much to share about this trip and the process of choosing communities that receive wells as well as the actual construction and maintainance of them. But for the purposes of this post, I’ll keep it brief and break it down into digestible portions. We partnered with Water.org to make this project happen. What that means is that Passports with Purpose raised the funds during our fundraiser and passed those funds directly on to Water.org. 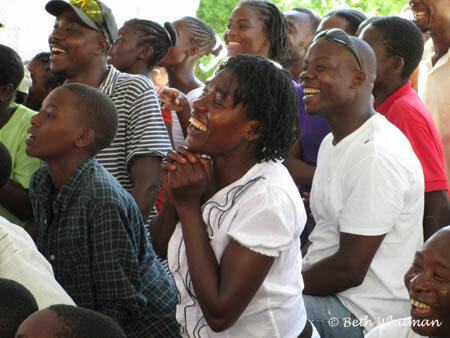 In turn, they worked with a local organization called Haiti Outreach. These folks work very closely with community leaders and residents to ensure that once the wells are constructed, their longevity is assured. The people that we spoke with made it very clear that the easy part was the construction and that the maintenance in the months and years to come is where the challenge is. 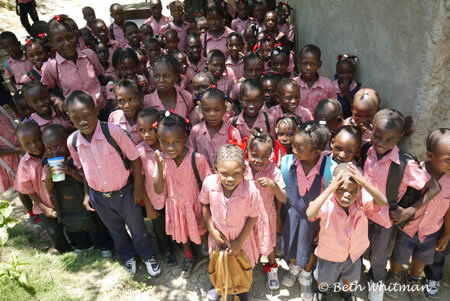 But the wonderful thing is that Haiti Outreach is there for the community – teaching them how to run, maintain, and manage the wells. While it might seem like a lot of layers to the program, it’s absolutely necessary to have all of these organizations involved to make the water wells a long-term success. 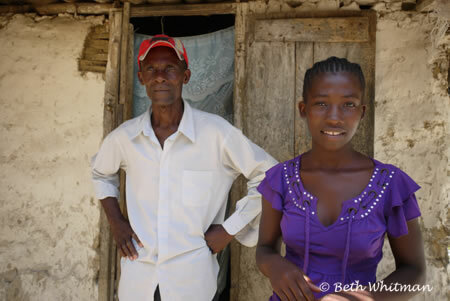 Selecting a community where a well will be built is a long process. 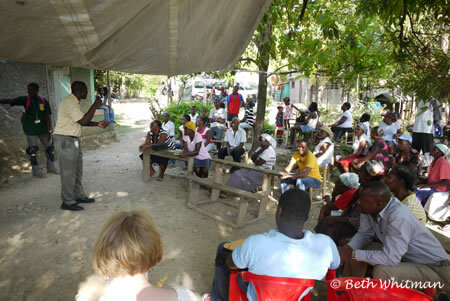 Community meetings are held (like the one below) with Haiti Outreach informing them about the process of building the wells and “testing” them with various questions. At first I was a bit shocked at how much the attendees were put to the test. Individuals were called upon to answer questions about clean water, hygiene, and the water wells. 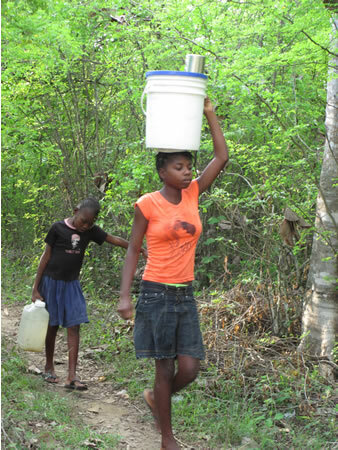 Some did better than others and after one meeting, one of the Haiti Outreach representatives commented that the community was not ready for a well. 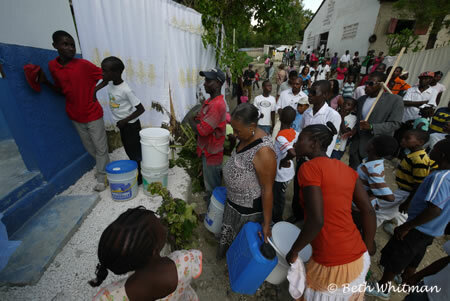 I kept saying how bad I felt for those communities that wouldn’t be approved for a well (at least not right now) but the more I saw Haiti Outreach’s detailed process at work, the more I realized that the communities who really wanted the well (and would be most likely to look after it for a long period of time) would be the ones to receive it. Once a community is chosen and the well is open, the residents have an opportunity to be “subscribers” and pay a monthly fee for all the water they need (only during times when the well is open to the community which is generally a couple of hours a day) OR just pay per bucket. Of course, paying as a subscriber is a better overall deal for everyone. Those who subscribe have access to all the water they need and having subscribers means that there is regular money coming in for maintenance and a guard who watches over the well during its open hours. At the end of our second day, we went to see one well in full working order and spoke to some of the residents there. Previously, they had to walk an hour one-way in order to get their water (which is carried in large buckets on their head). Now, the well was minutes away. We then had the honor to sit in on an inaugural ceremony in a village where a well was just being opened for the first time. Many in this community of 300 attended and there was an afternoon of speeches, thank you’s, and music and drama performances. The community just loved the performances and ceremony that happened just prior to the opening of the well. I can’t imagine how happy they must have been knowing they would have access to clean water after their previous well (NOT implemented by Water.org) broke eight months earlier. Water.org and Haiti Outreach do everything they can to ensure the longevity of a well so that it will last “forever” as Water.org’s Nicole Wickenhauser told us. 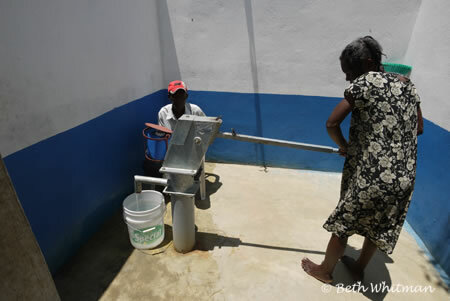 The wells are housed in a building that remains locked except for specific “open hours.” A guard (the gentleman sitting in the back) oversees the well and ensures that those pumping water are either subscribers or non-subscribers who’ve already paid their per-bucket charge. The well above was located right next to a school. That means that all these kids now have access to clean water. How amazing!! One health official we spoke to said that having access to clean water means these kids don’t get sick as much. Previously they were breaking out in rashes and also were battling diarrhea. Yay for healthy kids! This gorgeous woman told us that she had to walk an hour for clean water but now the well is so close she just has to walk a few minutes to fill her buckets (which she uses for food, bathing and washing clothes). 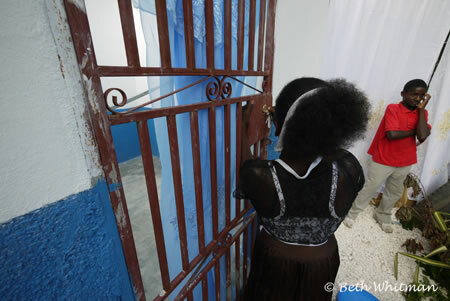 After the inaugural ceremony, a woman unlocks the water well for the first time to provide water for the community lined up behind her. Ready. Set. Go! Clean water for all! It was such an eye-opener to see this process at work – from how a community is chosen to the actual ceremony and opening of a new well. This visit really hit home how much the implementation of a new water well will drastically improve the lives of an entire community. I didn’t realize this but Nicole from Water.org had told me that the world’s water issues has more to do with accessibility than it does to scarcity. Except for some places on earth (such as sub-Saharan Africa), water is there, it’s just that people cannot get to it. Imagine that. Really, think about that. Thanks to the folks at Expedia for making this trip possible. They were responsible for sending Mara and I as well as a film crew. A video of our trip will be released in early June and I’ll be sure to share at that time! I too support water projects – in Cambodia and and Pacific through World Vision. Great to hear about the great work that Water.org does.Having access to clean water is an absolutely essential requirement for health. Amazing…great to see how this awesome cause makes a real world impact. oh! this makes me SOOO happy. thank you for sharing! What a rewarding trip! I’ve just secured my first big sponsor for a charity hike I’m doing, and I know how much work and trepidation can go into a trip of that nature. I greatly admire Passports with a Purpose and the work you guys do! Great story and lovely to hear of these projects. Interesting to hear of villages assessed as to whether they are ready to have a well. I do wonder though with these often being poor communities. With charges applying does this not penalise the poorest? What if they cannot afford a bucket of clean water yet need it to live? They say follow the money — and you did that to great effect. What a fascinating look at what happens when money raised gets put to good use. Interesting, too, that accessibility — and not scarcity — is the real issue.